I have been waiting for a good driver to emerge for the DNA's so when the Alpair 10P showed up as the answer, I pulled the trigger. 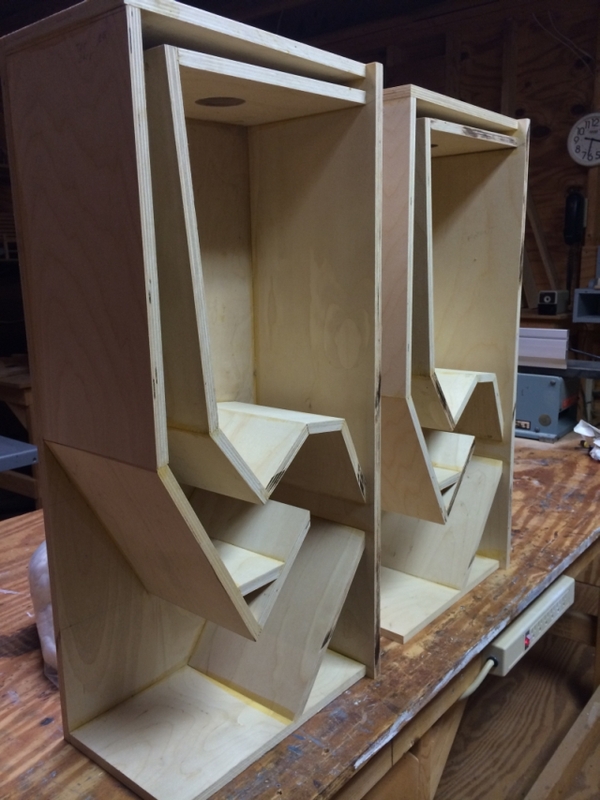 The cabinets have some difficult angles for an amateur, but I think they are turning out well so far. I can just imagine how beautiful Zygi's cabinets are. Eventhough they are small, there is quite a bit of work in them. I plan to install some damping only in the compression chamber at this time. I do plan, as well, to seal and clamp the sides on so that I can take them back apart to experiment with some horn damping. I would appreciate any input or advice about these speakers, especially about damping. Looking good. I am not sure about dampening but I would start off with ligning the back and the side wall next to the driver. Man those angles are complex. Does the directions clearly spell out the angle and the size of the pieces? Unfortunately the angles are not specked but there are plenty of measurements. You can pretty much figure out any part by looking at all the measurements. I sent the one best sheet to Kinkos and had them blow it up to full size. It was not perfect but it was very handy. I decided that the best way was to just take one side and draw the internal layout on it. I have now listened to one speaker with the side sealed and clamped on but with no damping. Next I will try some damping in the upper part of the horn and in the compression chamber. Fun! The Alpair 10P's require very careful run in so patience is a must. The Alpairs came with no paperwork or directions on break in. I think this is a bad flaw since multiple threads talk about the demanding specifics. That's where I found out the specifics of break in of the Alpair 10P. You would think that with the stringent requirements, break in instructions would be included. At DIY, Mark says not to exceed 70 db for 100 hrs. or risk damage. I think a new owner needs to know that. The Alpair 10p's now have about 110 hours on them which is just the first step in break in. Tomorrow, will be able to take them to 80db. Mark, at Mark Audio insists that very careful break in is extremely important, eventhough there is not one bit of information with the driver about proper break in. If you didn't search the internet, you would not know. I am thrilled so far with the sound quality of these DNA's. I could tell a big difference at 50 hours break in as the shrillness started to leave and the sound mellowed out. Sax and strings sound like you want to bite them..... sink your teeth in...... juicy! Im looking forward to getting several hundred hours on them to see what they do. Damping so far is some acousta stuff in the compression chamber and some very thin cork liner on the first two lines of the horn. The sides are just sealed and clamped on but once I determine the effectiveness of the cork, or possibly try some felt, I will glue the sides on and complete the build. Would still love to hear thoughts from others about damping. I am going to have some really good examples of speakers from both sides of the range. The Cornscalas are very efficient, powerful, extremely dynamic, but forward and technical. These DNA's are going to be musical, great imagers, and intoxicating. Complex crossover/front loaded horns vs. single driver/ no crossover/ back loaded horns. The DNA's have about 350 hours on them now and are incredible...........more than I had hoped for. I am amazed at the bass these little things produce. I use a sub now and then, but I really don't think it is needed. I am still playing with the damping a bit but am ready to button these things up and veneer them. Amazing speakers! God is in the Music. 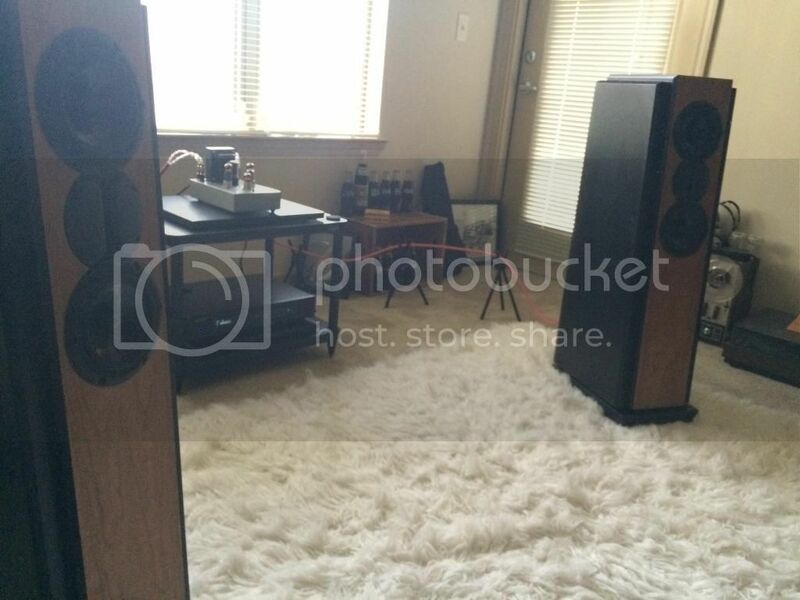 NAD 516/316 - Klipsch speakers. Complete cable looks by belden, kimber, monoprice. Nice job! All those angles are a challenge. They Look a lot like the ones I just built. After the mandatory 100 hour break in of the drivers they just keep sounding better and better. Thanks for the offer. I would love to have that info. Yes, great looking build compared to mine. I have just used felt to line the chamber with mine. I would love it if you passed on the information that Steve provided. Here on this thread or a PM. BTW, I heard the 10" bigger brother of this driver in a super pensil cabinet and they sounded very very good. How do the Super Pensils sound as compared? Which do you prefer? I will dig up the email from Steve and pass it along. This is a bit of a convoluted answer, but the gist of it is that I prefer the deep bass on the DNAs, but the accuracy of the bass in the Pensils. I can't speak to the rest of the spectrum because I have strayed from the DNA single driver design (see below). I have not had an opportunity to do a direct A/B test. Originally, I had the Tang Band drivers in the DNA. I could never get them loud enough with my Rachael amp. 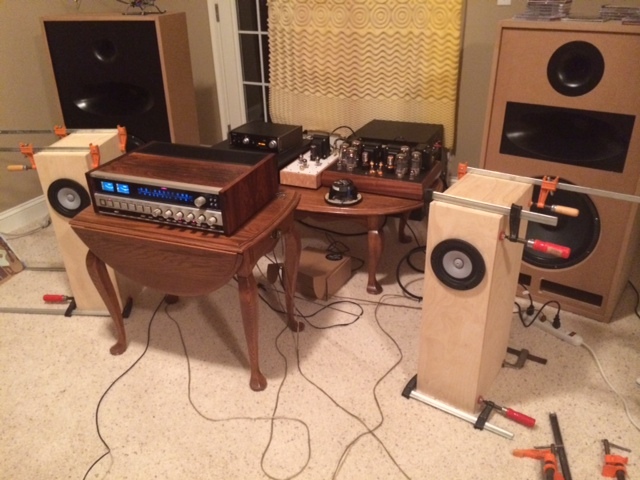 Bob Ziegler (Zygi) suggested I try a woofer/tweeter minimal cross over setup. I did and I enjoyed the overall sound better, but it was still not loud enough for me. If I had to pick, I would probably go with the Pensils, but keep in mind they are like 2.5 times the size of the DNA. Pound for pound, the DNA does a lot right. One of my regrets at Zenfest this year was I didn't get a good listen to the mark audio driver in the DNA. After hearing the Pensils with its bigger brother driver, I wish I had. Just an update on the DNA's. I used a 3/4 inch router on the front vertical corners but have yet to veneer them. I installed felt liner in the compression chamber along with the prescribed foam blocks. I have come back and installed some Acousta Stuff in addition and will likely add a bit more. They are getting better over time and it is hard to overdrive them. I purchased some MG944's and at this time, I seem to be listening to the DNA's more. The bass is faster and punchier, the mids seem to be a bit less mellow on the DNA's and the highs are not quite as pronounced as in the 944's. The 944's are just are not as exciting as the DNA's. The mids are what seem to be improving now, it was the bass that improved most already. I will work on my room some more before I tweak too much more on them. I am certain my room is deficient so no used to work on the speakers too much more just yet. I remain amazed at how much sound comes out of these little speakers. Currently I am listening to Rick Wakeman's Journey to the Centre of the Earth. 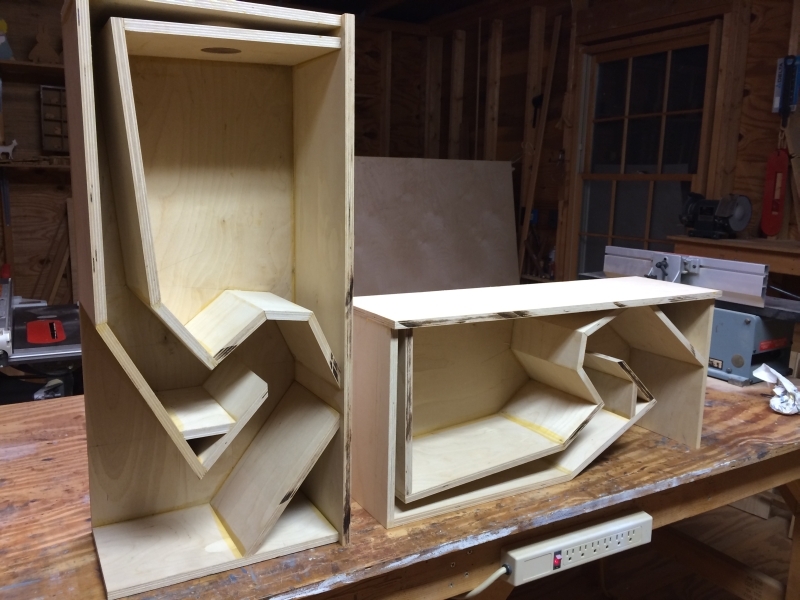 The recent mentioning of the DNAs got me looking at the Decware pages and they look like a great DIY speaker project. Does anyone know what the drivers cost? Is it possible to find the originally recommended drivers? The radius corners would be a challenge but given the size, solid wood cabinets might be an option, which would make radiusing the corners no big deal. Not sure how the density of different cabinet materials might effect the ultimate sound though. Madisound sells the drivers for $110.00 each. 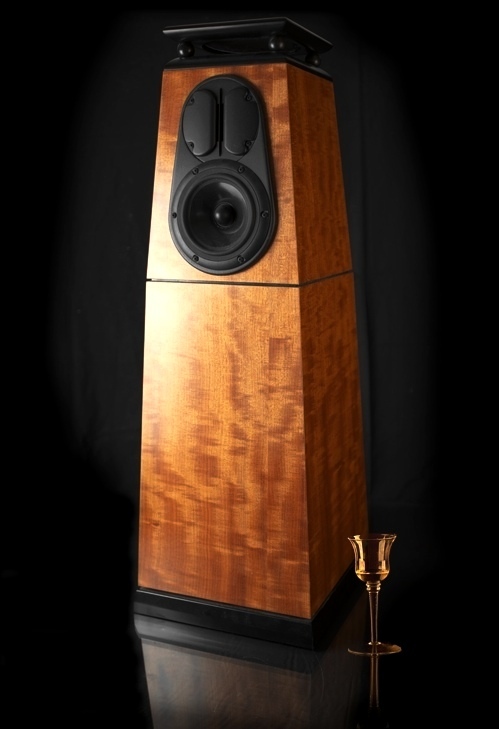 Its the Mark Audio, 6" Alpair-10P paper cone driver. Using the Mark Audio drivers you will need to add a second inner baffle if you want to flush mount the driver, which I recommend doing. In that case, I'm not so sure a solid wood baffle couldn't be used which would allow you to apply the 3/4" round over to the front edges. A quirk joint of sorts could then be used for any annual expansion/contraction to hide wood movement. I haven't tried this, but I'm pretty confident with a few other precautions it would work quite well. Thanks Zygi, if I decide to build these I might have a few questons for you. I have your HR1s with a ZMA so I'm not really looking for a speaker for my primary system but if I put together something with one of Steve's lower powered amps I might try these. How do you think they compare with the HR1s or other DIY speakers? I think I read that the drivers are about 90db with 1W at 1m so I'm not even sure if they'd be appropriate with, say a 2w amp. Because its not your primary system, and the fact that you have all the power/volume you would need from the ZMA/HR-One set up I think the lower 2 watt amp with the DNA's would do just fine. Thinking we were going to use the new DNA I built for Steve at the fest this year I used the DNA's as a bedroom system with the mini Torii for a few weeks. It was enough to get the wife upset more than once as it got pretty loud! I think the Mark Audio rating was a bit on the conservative side, unlike most manufactures that stretch the truth just a bit. You could probably guess that I'd be a little biased toward the HR-Ones seeing as they are still my favorite, if I never sold a pair I'd have been happy, to me they are the perfect speaker. With that said the DNA's are very neutral for a single driver speaker, leaning toward detail. Which is pretty tough to pull off in my opinion. As far as questions if you do decide to build....ask away!